What happens to botanicals during distillation? Indulging in the scent of my favourite gins, then taking a sip to revel in the flavour, provides instant fulfilment for which I’m deeply grateful. But who should I thank for such an experience? The credit can of course go to the distiller, though without the botanicals there’d be no source of aroma or flavour. That raises the question – how are botanicals, such as juniper berries and lemon peel, converted into a liquid triumph? The essential fact is that botanicals contain essential oils and flavour compounds, which are soluble (ie. ‘dissolve’) in alcohol. 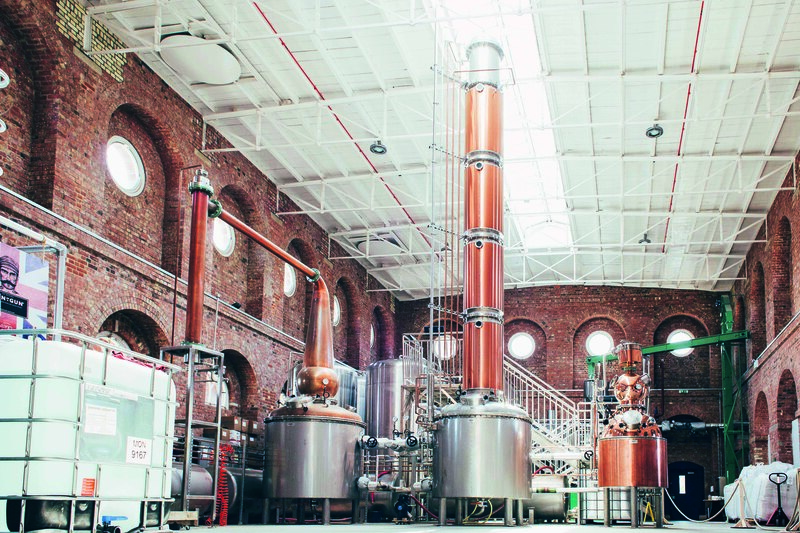 This vital rendez-vous between alcohol and the botanicals takes place within a pot still. ‘When the flavours are extracted by the alcohol is when the magic happens,’ says Alexandre Gabriel, master distiller, Citadelle Gin, distilled in France. The alcohol is in the form of rectified spirit, ie. distilled to around 96% ABV. However, it’s diluted with water prior to distillation to reduce the strength; this varies among distilleries though is usually up to around 60% ABV. The heat of distillation subsequently brings the essential oils and flavour compounds to boiling point, when they vaporise. Continuing through the pot still, vapours reach the condenser, where cooler temperatures see vapours return to a liquid form. in a copper basket suspended within the neck of the still, above the alcohol (which is in the base of the still). Heating the still raises the temperature of the alcohol until it vaporises, and vapours ascend the neck of the still. When the alcohol vapours reach the basket and meet the botanicals, the vapours ‘extract’ essential oils and flavour compounds. This ‘ensemble’ of vapours continues to the condenser. More distilleries use steeping, which entails placing the botanicals in the base of the still together with the alcohol (exactly how long before distilling depends on individual production regimes). ‘The benefit of steeping botanicals is that even before distillation there’s a very good preliminary extraction of flavour by the alcohol,’ says Desmond Payne, master distiller, Beefeater. Distillation begins by heating the still, typically using steam conducted through pipes arranged in the base of the pot still. Once the alcohol reaches a temperature of 78 degrees centigrade, the first alcohol vapours begin to rise and ascend the neck of the still. Meanwhile, essential oils and flavour compounds each have their own volatility (ie. boiling point) at which they vaporise. Lighter flavour compounds and essential oils become volatile at relatively lower temperatures, and progressively richer compounds become volatile at increasingly higher temperatures (the temperature in the pot still continues to rise during distillation). However, it’s the alcohol vapours that act as a ‘taxi service’, carrying the essential oils and flavour compounds up, up and away into the neck of the still and onto the condenser. There’s a particular sequence in which the botanicals reach volatility, though that’s not the entire story. Each botanical contains a range of essential oils and flavour compounds, from lighter to richer, which become volatile at different temperatures. ‘Very light citrus notes come off first, then juniper, followed by coriander, and finally it’s the root botanicals, such as orris root and angelica root. Distilling a batch of gin can take several hours, and every 15-20 minutes the profile of the distillate changes, with notes from a particular botanical at the forefront at different stages. But something from all the botanicals is also going on at the same time in the background,’ says Jamie Baxter, a master distiller and consultant. With so much happening, let’s look at the range of characteristics that key botanicals offer. ‘The initial citrus notes from lemons and oranges are stunning, light and ethereal, and very zesty, which provide aroma in the resulting gin. As distillation continues, the citrus characteristics become medium-bodied, still contributing freshness but evolving from zesty to more juicy flavours, with greater body and richness, and these provide the flavour in the resulting gin,’ says Patrick van Zuidam, master distiller at Zuidam in the Netherlands. Juniper continues the citrus theme, while also introducing others. ‘The first notes from juniper berries are lighter, including citrus, floral and some piney notes. As distillation continues the pine notes become more intense and the juniper is spicier, the essential oils are also richer and provide more weight and body, which contributes to the mouthfeel of the resulting gin,’ says Alexandre Gabriel. Coriander is typically the second choice of botanical after juniper. ‘Coriander initially provides very light lemon notes, which evolve with an element of woodiness in the middle of distillation, and at the end of the distillation run, coriander gives very woody, stewed, vegetal notes,’ says Abhi Banik. This highlights the fact that each botanical yields a range of notes during distillation, some of which are appropriate to the house style, and others not. ‘The botanicals contain thousands of different flavour compounds that are being distilled in an ever changing environment, in which the temperature is rising and strength of the alcohol is changing,’ says Ollie Kitson. But this scenario also provides choice. Distillation is a process of separation, enabling the distiller to select spirit with the required profile. At the beginning of distillation, for example, the strength of the spirit rises rapidly, reaching around 85% ABV, then decreases. The profile of the resulting distillate also evolves as the alcoholic strength changes. The initial distillate, known as the heads, has an inappropriate character, as does the concluding phase of distillation, known as the tails. The middle phase, known as the spirit cut, provides the characteristics which the distiller is looking for (and it’s collected separately from the heads and tails). ‘The heads are very brief, and you can start collecting the spirit cut in about 10-15 minutes. Exactly when to start, and when to end the spirit cut is a personal judgement, the strength of the alcohol is one of the criteria to make this judgement, but what’s most important is to assess the character of the spirit and use this to make the decision. This is because distillation isn’t an identical process each time, and various details such as the ambient temperature, which can change significantly throughout the year, influence how the process unfolds,’ says Desmond Payne. There’s one final task. Clearing up. so there is another use for the botanicals once we’ve finished with them,’ says Desmond Payne.